The Northwest Flower & Garden Show which is scheduled for February 17-21, 2016 is held at the Washington State Convention Center where garden designers incorporate approximately 29,000 blooming bulbs, 60 tons of rock and 900 cubic yards of mulch and fill dirt that makeup themed gardens covering one acre of the show floor. You’ll enter the gardens in awe and leave inspired. Garden designers, horticulturist and gardening authors share their expertise on many subjects and container gardening, pruning, flowering arranging and the best of edible gardening are just a few of the seminars available at the show. The Marketplace is where you will find over 300 exhibitors with the latest tools and accessories for your home and garden along with plants and pieces of unique furniture and yard art to make your garden special. But if your travels bring you to the Puget Sound area other times of the year there are many great nurseries and gardens to visit that will inspire you to rethink your garden when you return home. City People’s Garden Store – has a wonderful urban nursery filled with plants and garden supplies for every season and a gift shop full of wonderful finds. Molbaks Garden & Home – has an extensive nursery with every plant under the sun along with a great selection of gifts for the home and outdoor furnishings and a quaint cafe. 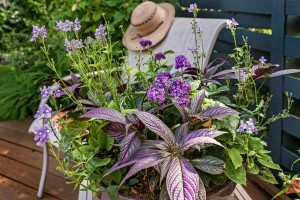 Ravenna Gardens -brings stylish plants and garden accessories suitable for the smaller indoor and outdoor space. Swansons Nursery – a favorite of Seattle Gardeners offers a huge selection of plants, indoor and out with knowledgable staff to help answer any questions you may have along with a large selection of pots. Take time to visit the nursery cafe and gift shop too. Center for Urban Horticulture & Elizabeth C Miller Horticulture Library – know for it’s extensive public library also includes a botanic garden with landscaped grounds and a nature area for bird-watching adjacent to the University of Washington campus. Highline Botanical Garden – covers 10.5 acres of display gardens, woodlands and trails reclaimed from a suburban brownfield. A perfect place to stop by if you have an hour or two of time before heading back to the airport. Kubota Garden – hidden in south Seattle is a 20 acre treasure that blends Japanese garden concepts with native Northwest plants. Lakewold Gardens – located in south Tacoma starts with visitors stepping back in time with a Georgian-style mansion surrounded by hundreds of rhododendrons, Japanese maples and distinct gardens which include rose and knot gardens, fern and woodland gardens and rock gardens. Rhododendron Species Botanical Garden – has a vast variety of rhododendrons and azaleas along with orchids and tree ferns nestled amongst waterfalls and towering boulders. Seattle Chinese Garden – is one of the largest Chinese gardens outside China, showcasing not only plants but also stone, architecture and water elements. Located adjacent to South Seattle Community College with breathtaking views of downtown Seattle, Elliott Bay and the Cascade Mountains in the distance. Volunteer Park Conservatory – in the historic, Olmsted designed Volunteer Park, is a very special place to the people of Seattle. Whether you’re an accomplished horticulturist or just like looking at flowers, there’s something for everyone and the conservatory is breathtaking to see. Woodland Park Rose Garden – is one of only two dozen certified American Rose Test Gardens in the United States. The garden is small taking up just two acres but the roses – bush, hybrid, miniatures, climbers and tree roses are beautiful to see and smell and the gardens gazebo is a favorite venue for weddings. W.W. Seymour Botanical Conservatory – located in Tacoma adjacent to Wright Park is a lovely little conservatory overflowing with displays of magical plants and glass artwork which makes for a kaleidoscope of color. Four times a year they add new plants to coincide with the season.